Pure CLA 1250 by San Nutrition is a blend of fatty acids, most notably conjugated linoleic acid, for weight loss. It is said to be effective in preventing fat storage in the body and using up stored fat for energy. The manufacturer says that it also promotes lean body composition, which makes it ideal for those interested in muscle building. CLA, the main ingredient, is also known to improve the immune system and reduce both cholesterol and triglyceride levels. The naturally occurring fatty acid is beneficial to the body, but often available in inadequate quantity, so a supplement makes sense to many. 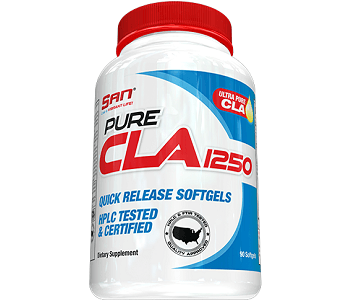 With a large number of similar products to choose from, find out in this San Nutrition Pure CLA 1250 review if this particular product stands out from the crowd. Other ingredients are bovine gelatin, caramel, glycerin and purified water. As can be seen, the major constituent is CLA. This is the main factor in the efficacy of any CLA-based supplement and is said to help prevent fat buildup and to oxidize fat for energy needs of the body, assisting in weight loss. However, San Nutrition does not guarantee that the CLA content in its softgels is up to 85% concentration, the optimal dose used in some studies. The suggested serving size for Pure CLA 1250 is one softgel. It appears this has to be taken three times in a day, with meals, like most other similar products. The manufacturer supposedly advises not to take more than six softgels in any 24-hour period. A bottle with 180 softgels was available for purchase from the manufacturer’s website for $29.96. The same bottle was listed for $23.38 on Amazon. San Nutrition says it offers up to 50 percent discounts plus free shipping on orders of $75 and over. We were unable to find a money back guarantee on the official product page. But we found out from a third-party source that Pure CLA 1250 comes with a 30-day money back guarantee. It is not certain if this covers already used products. It would probably be best to contact the manufacturer directly for clarification of their policy. 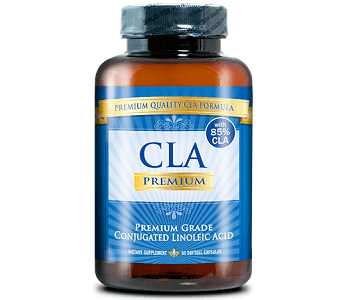 This CLA supplement does not appear to be very popular among buyers. There were only six customer reviews on Amazon at the time of writing, not enough to draw any firm conclusions regarding the effectiveness of the product. (We do note that five of these were five-star reviews and the remaining one-star). You may benefit from the use of this supplement. The list of ingredients looks good, except that CLA content is not at least 85% as used in some studies. Pure CLA 1250 is also reasonably affordable, though by no means the least expensive in the category. However, a money-back guarantee is not clearly stated on the manufacturer’s website and the dosing information is equally unclear. If you are looking to buy a popular CLA supplement with a solid money-back guarantee so you can try it risk-free, this might not be the one for you.